Aster Paeony Duchess Apricot Callistephus Chinensis is one of the most beautiful annual asters. 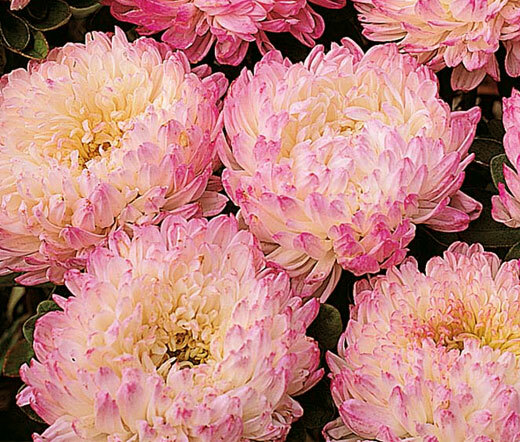 This variety of Paeony Duchess Aster produces huge, peony-like, apricot colored flowers with fully double incurved petals that are similar to a Chrysanthemum. Callistephus Chinensis grows vigorously and features up to 5-8 upright floral stems per plant. The fragrant blooms appear from summer through fall attracting masses of birds, bees and butterflies. Aster Paeony Duchess Apricot is a perfect flower for cutting gardens, and it is for borders and flower beds as well. Like all China Asters, Aster Duchess is heat resistant and likes full sun, but can tolerate some partial shade as long as well-drained soil and moderate watering are provided. Aster Paeony makes a magnificent, long lasting cut flower.